This story inspired me to chime in, especially as we’re right in the middle of pre-draft-mania and the tournaments leading up to the College World Series. (Wish I could be in Chapel Hill this weekend for the super regional between host North Carolina and East Carolina … I could call it the Aunt Bowl in honor of my daughter, whose aunt on one side lives right outside of Chapel Hill and whose late aunt on the other was an esteemed professor at ECU before she passed away in 2006). Anyway, the story linked is about a high school playoff game in Minnesota where both starting pitchers threw more than 200 pitches. Sounds impossible to fathom in this world of pitch counts where an outing of more than 100 pitches borders on abuse. But it brought back memories of the first college post-season series I ever covered as a sportswriter, the first time I went on the road, the first time I felt a part of baseball writers’ press box camaraderie, and the week I realized yes, this is what I want to do. The year was 1988. The place, Beehive Field in New Britain, Connecticut. The event: The ECAC (East Coast Athletic Conference) tournament, the winner of which would move on to the Northeast Regional tournament, which would also be held at beautiful (not) Beehive. I was there to cover the Fordham Rams, the MAAC champions. Although the paper for which I was working covered Fordham regularly during both football and basketball season, it pretty much ignored all college baseball teams. But the Rams were really good, even with the loss of their 1987 ace Pete Harnisch, who had been a first-round pick by Baltimore in the previous year’s First Year Player Draft. Perhaps their best player was a freshman outfielder named Ray Montgomery who had a school record 21-game hitting streak and earned Co-MAAC Player of the Year honors. He went on to play in the big leagues and is probably too busy this week to read this blog entry since he’s the Assistant Scouting Director for the Milwaukee Brewers (but I bet he’d remember the game). 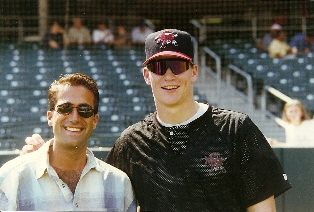 (Here he is with MLB Network star Matt Vasgersian at a Triple-A All-Star Game back when they were both up-and-coming future stars). So since I wanted to be a baseball writer and was getting basically NO opportunity to do at that time at that job, and since Fordham really deserved someone covering them through the post-season, I volunteered to become their beat writer on my own time and my own dime. I guess the price was right because they let me do it. Also in the tournament were Hartford, featuring slugging third baseman Jeff Bagwell (the scouting report on him was pitch him inside), Maine with a freshman outfield sensation named Mark Sweeney, LeMoyne (their ace was a kid named Peter Hoy who made it briefly to the big leagues), C.W. Post and Fairleigh Dickinson University, aka FDU and aka a big rival of Fordham. I was all eager beaver reporter armed with my scorebook and about 82 pens (some things never change), assiduously writing down not just every play made but every pitch thrown. It was the Rams’ second game of the tournament and their first against FDU where that habit almost caused carpal tunnel syndrome. On paper, it was just your typical garden-variety 14-inning game (the Rams would go on to play a 19-inning game against Clemson in the first round of the Northeast Regionals later that week), which Fordham lost, 6-5 (they would come back to beat FDU the next day by the same score). Neither team had lost yet in the double-elimination tournament so while the stakes were high, they weren’t THAT high. Fairleigh Dickinson sent its ace to the mound, a sophomore right-hander named Mike Mongiello who was their conference’s Player of the Year that year. And he pitched like an ace for nine innings. When he came out for the 10th inning, the reporters all glanced at each other in surprise. When he came out for the 11th inning, I counted my record of all the pitches he’d thrown. I don’t remember the total at that point but it was really high. In the 12th inning, the “official” pitch count for Mongiello, who was still in there, was relayed up to the press box from the FDU dugout and let’s just say it was significantly lower than the number indicated in my scorebook. And while I may have MISSED a few pitches, I certainly hadn’t ADDED 20. Mongiello remained in the game for the 13th and 14th innings and finally came away with the complete-game win in an absolutely masterful and gutsy performance. FDU’s official pitch count for him was 215 pitches. That is what I wrote in my story. My scorebook showed 250 pitches. That didn’t include warmups between innings and may have missed a few full-count foul balls. Mongiello went on to be drafted in the seventh round of 1989 by the Chicago White Sox and enjoyed a seven-year Minor League career with them, getting as far as Triple-A and posting a 3.64 ERA. Our paths crossed in the Minors a few years later and of course I had to go over and introduce myself and tell him that I had been there for that amazing game. Apparently he must have told some of his teammates about it and no one believed him, or at least thought he was exaggerating. I was able to not only confirm the epic outing, but add that in fact his own telling of it with a pitch count of 215 wasn’t giving himself enough credit. He obviously had no hard feelings about the workload either, because he spent some time later on at FDU as their assistant pitching coach. I’m guessing, though, that he never left one of his pitchers in to throw 250 pitches.